A hot favourite Bengali palate for lunch and dinner. Clove or thread for binding. De-vein shrimp. Wash properly. Sprinkle turmeric powder and salt. Boil for 1 mint with little water so that water will absorb totally in 1 mint. Wash pumpkin leaf with salted luke warm water properly and pat dry. Wash poppy seed in a small sieve properly before grinding. Wet grind poppy seed with little water , 4 pcs.of Green chili and a pinch of salt to a smooth paste. In a bowl mix poppy seed paste, shrimp, salt and mustard oil properly. Spread pumpkin leaf in a plate. 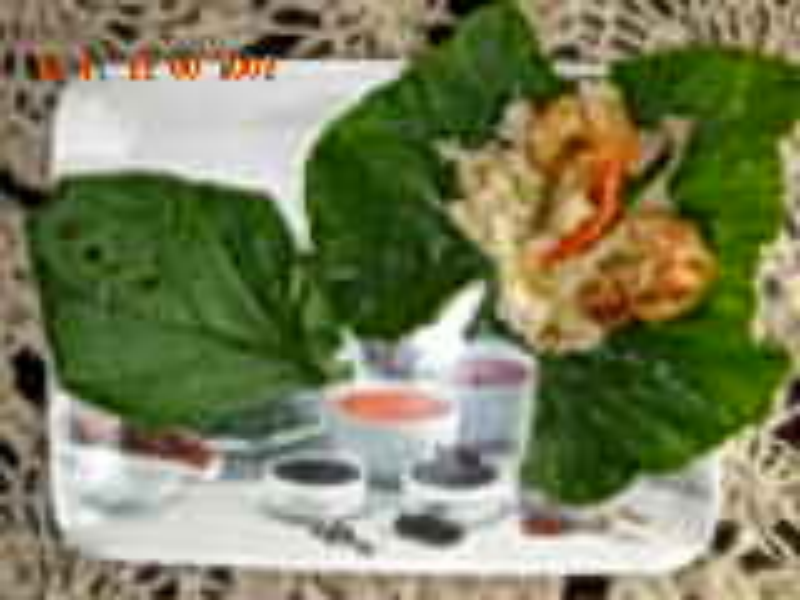 In each pumpkin leaf, place two shrimp with poppy seed mixture and green chili. Fold the leaf from four sides and prick clove or tie thread properly. In a nonstick pan heat 2 tbsp of mustard oil for two pumpkin packets. Bring to a medium heat and place the packets carefully. Fry both the side in low or medium heat. Instead of frying, a steam cooking (bhapa) will also bring an awesome taste.